Aflatoxin is a mycotoxin created by a specific mold that can grow in the field prior to harvesting crops, most commonly we see this occurring in corn during wet years. High levels of aflatoxin in grain are not allowed for human consumption or use in some animal feeds. This can dramatically lower the value of your crop, especially if that crop is corn, as most corn is used for consumption by humans or animals. 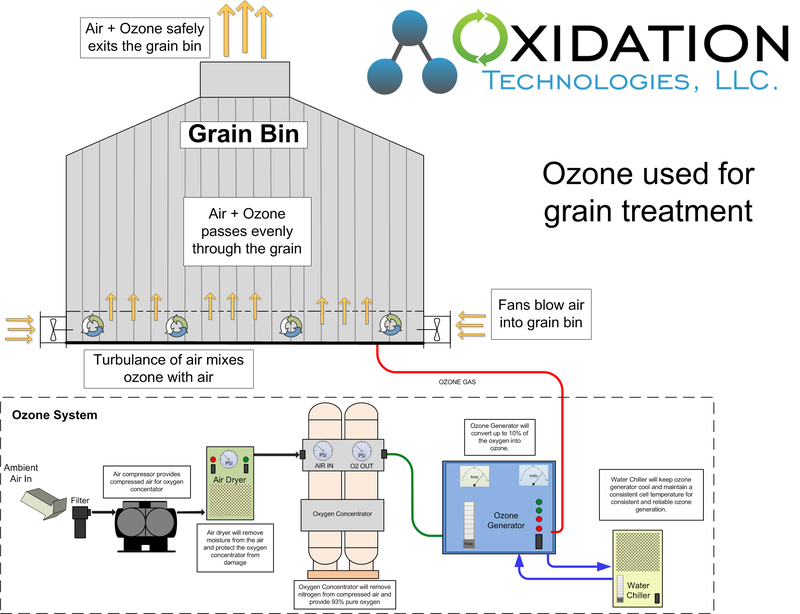 Ozone has the ability to oxidize and break down aflatoxin in grains. Due to the fact that aflatoxin is a result of mold that is most likely not present anymore in your grain, when the aflatoxin levels are reduced to acceptable levels they will stay at those levels and not rebound. While it is challenging to eliminate 100% of the aflatoxin in grains, reducing the level to normal, and safe levels is very reasonable. Additional research has been promising on the reduction of other mycotoxins including vomitoxin and deoxynivalenol in various grains.